Life Is Beautiful Filming in Downtown Las Vegas TONIGHT! Come be a part of it! | Do You Hear The Music? 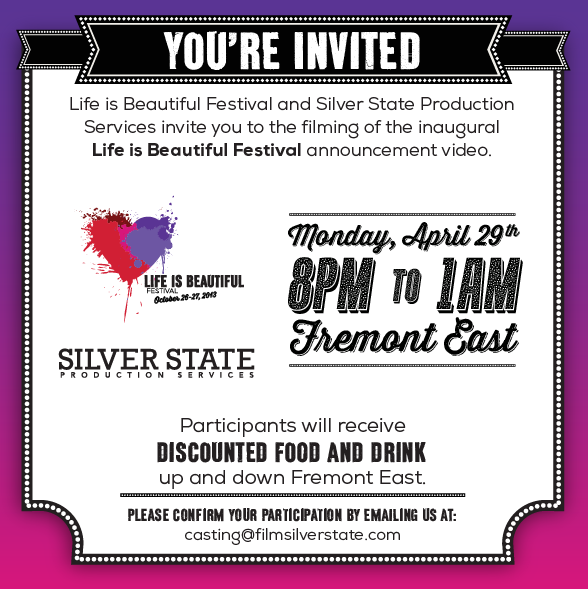 Life Is Beautiful Filming in Downtown Las Vegas TONIGHT! Come be a part of it! Come one, come all! Tonight we are filming our announcement video for Life Is Beautiful and need all your beautiful and smiling faces to be a part of the action! Details below but come make some history with us and don’t forget, the Festival takes place October 26-27 in Downtown Las Vegas!.